A pullet is a young hen that has never laid an egg. Pullets are highly valued for the end of year festivities and Label Rouge pullets are faithfully reared according to tradition. The tender and tasteful flesh is perfect for the most refined dishes. Pullets are reared in little flocks in small, well-lit poultryhouses (400 m² maximum) in natural daylight. The maximum stocking rate allowed inside the poultryhouse is 9 pullets per m². As soon as their feathers are fully developed, they are allowed to freely roam a grassy/shady area (3 m² minimum per pullet). At least 75% of their feed during the fattening period must be comprised of cereals and cereal-based products during the fattening period. They are kept inside for the last two weeks of the fattening period and fed a diet containing at least 80% cereals, plus extra dairy products if necessary. 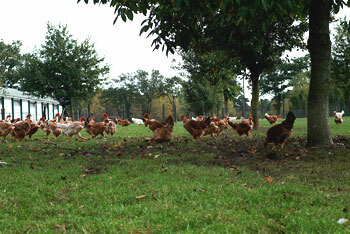 Label Rouge traditional pullets are not slaughtered until they are at least 120 days old. Label Rouge traditional pullets are class A fowl (European standard pertaining to external appearance) and they must therefore be perfect in terms of their presentation. They can be presented partially eviscerated (with giblets), ready-to-cook, or cut up into portions. Their mean weight as ready-to-cook fowl is around 1.8 kg. 13 days maximum after slaughter for cut portions of pullet.